You won't see this photo on CNN. Everyone is too busy showing the Queen being touched. This was a moment of "touching" that won't be forgotten by this bobby. "This is the most powerful photo in the series. Remember they are not supposed to shake hands, but the two brothers couldn't resist the historic moment. 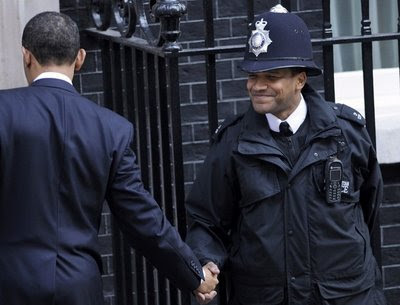 The black royal cop never imagined in his wildest dream that he would usher a black American president into the British corridors of power. Nice."